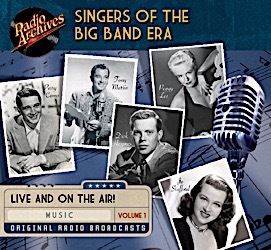 The CBS Radio Workshop debuted at the end of the Age of Classic Radio, which was a time of innovation and experimentation, especially in terms of radio drama. 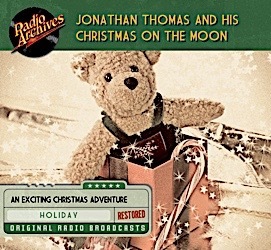 The ten-hour Volume 4 includes “All Is Bright”, a history of the famous Christmas song; “1489 Words”, which featured the debut of later film composer Jerry Goldsmith’s “The Thunder of Imperial Names”, which was written for a concert band and was based on a text piece by Thomas Wolfe; a two-part adaptation of Frederick Pohl and Cyril M. Cornbluth’s The Space Merchants, which offers a satirical look at rampant consumerism from the viewpoint of an advertising executive; Archibald MacLeish’s “Air Raid”, the series’ only re-broadcast, which had first been written for the 1938 Columbia Workshop. 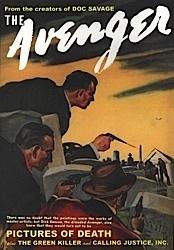 Aired during the Cold War era, it took on a sinister new meaning; Henry Fritch’s “The Endless Road”, about a road to nowhere being built in the Caribbean and the corruption surrounding its construction; “A Dog’s Life”, which was the actual recordings of a pound dog being adopted raised by a man; Rose Orente’s “Carlotta’s Serape”, a play in verse, was the winner of a jury-chosen contest offered by The Academy of American Poets and CBS; Elliott Lewis wrote, directed and performed “Nightmare”, about a man who suffers from nightmares so bad that he can no longer distinguish sleep from reality. 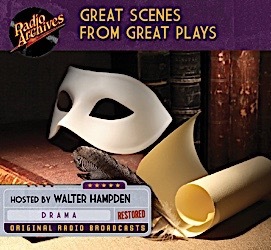 CBS Radio Workshop not only continued to push boundaries in terms of utilizing story, music, voice and more in exciting, modern ways, it broke new ground in radio drama. 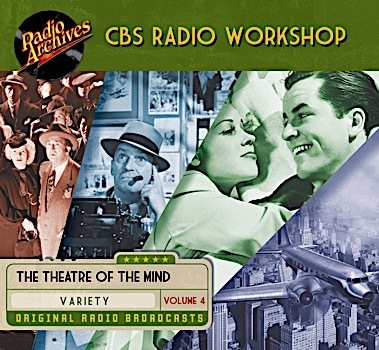 In short, theCBS Radio Workshop set the standard for modern audio drama. Blending sound effects with story, music with voice, and quality with substance, the episodes on CBS Radio Workshop, Volume 4 shows how boundless storytelling can be with audio drama. 10 hours $29.98 Audio CDs / $14.99 Download. We have 240 radio collections and the final 8 sets are now being converted to the Digital Download format. We are very pleased to announce that 4 radio collections are available for the first time today as digital downloads. The remaining 4 sets will be released soon. Great shows, great sound, and great prices, too! Old-time radio fans love and revere actor Bob Bailey - particularly when it comes to his long-running stint as “America’s favorite freelance investigator” on the classic radio crime drama “Yours Truly, Johnny Dollar” in the 1950s. 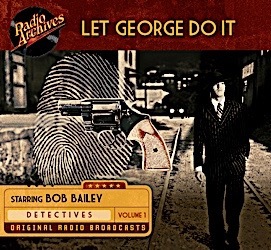 But before landing that lucrative gig, “Robert” Bailey cut his teeth on another detective show favorite that ran on the West Coast Mutual-Don Lee network from October 18, 1946 to September 27, 1954: a decidedly offbeat private-eye series entitled “Let George Do It.” George Valentine was an ex-cop-turned-private-investigator who set himself apart from his private eye brethren - at least, in the early episodes - by eschewing tough-guy muscle in favor of a certain manual dexterity and analytical thinking skills. His cases ran the gamut from murder to blackmail to kidnapping. 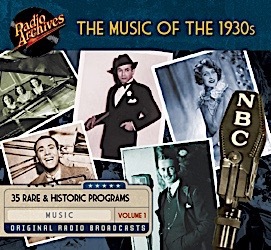 The episodes offered in this collection originate from transcription discs syndicated by the New York-based Harry S. Goodman Radio Productions. The discs themselves were found in Toronto and were originally syndicated throughout Canada by S. W. Caldwell Ltd. 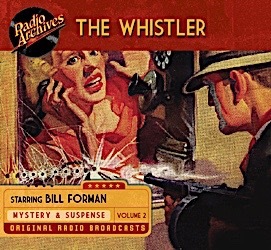 The audio quality of these recordings is exceptionally fine and, at first listen, it was assumed that the original scripts from the series had actually been re-recorded for syndication. However, additional research - and, particularly, reviews of the cast listings - lends credence to the theory that they are instead edited and repackaged broadcast recordings of the original 1946-54 Mutual-Don Lee run. The fact is, at this writing, there is no way to be certain of their origin -- but what is certain is that several of these broadcasts are not mentioned in any of the program logs for the series, suggesting that this is the very first time they have been made available for modern listeners to enjoy. Thanks to expert transfers and complete audio restoration, the crystal clear recordings in this ten-hour set give you the opportunity to really hear what happens when you “Let George Do It”. 10 hours. Regular Price $29.98 - Specially priced until September 12 for $14.99 Audio CDs / $7.49 Download. The jade-robed Buddhist priest who battled crime as The Green Lama is back. 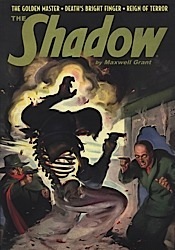 Conceived in 1939 at the behest of the editors of Munsey Publications to compete with The Shadow, The Green Lama was the creation of writer Kendell Foster Crossen, who was asked to think up a hero who could lure mystery-minded readers away from The Shadow’s loyal legion of followers. “The basis for the Green Lama came after I’d read a non-fiction book review in the New York Times about an American who really became a lama,” Crossen once recalled. “The book was titled, The Penthouse of the Gods.” That individual was Theos “the White Lama” Bernard. Returning to the States, young Jethro Dumont assumed an alternative identity of the Buddhist cleric, the Reverend Dr. Charles Pali, then began gathering about him a band of civic-minded citizens to join him in his Buddhistic battle against suffering in all forms—particularly those caused by criminals. And aiding him from the shadows, the mysterious Magga, a woman of many faces who has taken an interest in guiding The Green Lama’s campaign against malefactors. One of the fascinating and delightful things about Ken Crossen’s Green Lama stories is the parade of supporting characters popping in and out of the action during the course of the series. In our first selection, The Man Who Wasn’t There, two of these announce their intention to marry. In the second story, Death’s Head Face, they do wed, thereby paving the way for a resourceful new couple to work in service to The Green Lama. And so, bid farewell to Gary Brown and Evangl Stewart, and say hello to Broadway-bound actors, Ken Clayton and Jean Farrell. You’ll be hearing more about these latter two in upcoming audiobooks. Otherwise these exciting stories tell the linked tale of The Green Lama’s confrontation with James Nord, the Man with the Death's Head Face. He's the only villain the Lama tackled twice. They first encounter one another aboard the S. S. Cathay, as Jethro Dumont returns from his previous adventures in Hollywood, while Nord is operating a smuggling ring. Back in New York for the sequel, Dumont begins the search for The Murder Corporation’s skull-faced chief executioner. James C. Lewis again essays the triple role of Jethro Dumont and his emerald-clad aliases, Reverend Dr. Pali and The Green Lama....Om Mani Padme Hum! The Green Lama Knows! 6 hours $23.98 Audio CDs / $11.99 Download. Read this vivid saga of crime-fighting and put yourself in Richard Wentworth's place! Feel the keen sense of danger, the thrill of battle both wily and furious as you pit yourself against Red Feather while he holds New York in his crushing grip of terror... Red Feather, the monster who launched the Torture Trust — a scheme to make millions of dollars out of pain! Total Pulp Experience. These exciting pulp adventures have been beautifully reformatted for easy reading as an eBook and features every story, every editorial, and every column of the original pulp magazine. $2.99, Save $1.00. Helpless America had been hurled back into the abysmal dawn of history, by those guerilla bands of the Purple Emperor, which had been loosed in fury and hate to put civilization to fire and sword. Across the Hudson, slaying as they came, advanced the Gothic hordes which would sack the nation’s great metropolis. 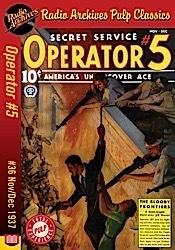 And only Operator 5, racing against time and fate, could hope to challenge this new, grim menace which threatened the entire world with primitive darkness! Total Pulp Experience. These exciting pulp adventures have been beautifully reformatted for easy reading as an eBook and features every story, every editorial, and every column of the original pulp magazine. $2.99, Save $1.00. The skies are filled with the birds of war, and the echoing cries of the vanished dead. And it is here Bill Combat makes his fight against a power whose creed is Hatred! A Yankee flier in Europe’s bloody skies, he lends his skill and his courage that freedom may not perish beneath the heel of tyranny — that the brave might be forced to salute no flag except their own! Fly the skies of early World War II with Captain Bill Combat — the war ace who fought across Europe through the smoke of human liberties as it vanished from the earth. Fearlessly he battled the minions of the Nazi war machine. The Nazi evil had murdered his mother and uncle, and he vowed vengeance. It was a rousing call to America, which had not yet entered the war. But it was a call that only lasted for three issues of Captain Combat magazine: April, June and August of 1940. Captain Combat was a symbol created by author Barry Barton to do and say the things that America couldn't officially say in those perilous times. Read along as blue skies turn red above, as green pastures become the barren homes of the dead. Today it stands as a rare glimpse of what fear fanned across America in the days when war was an ominous threat upon a bloody horizon. Captain Combat returns in these vintage pulp tales, reissued for today’s readers in electronic format. $2.99, Save $1.00. In 1934 a new type of magazine was born. Known by various names — the shudder pulps, mystery-terror magazines, horror-terror magazines — weird menace is the sub-genre term that has survived today. Dime Mystery Magazine was one of the most popular. It came from Popular Publications, whose publisher Harry Steeger was inspired by the Grand Guignol theater of Paris. This breed of pulp story survived less than ten years, but in that time, they became infamous, even to this day. 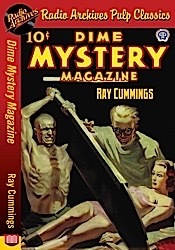 This ebook contains a collection of stories from the pages of Dime Mystery Magazine, all written by Ray Cummings, reissued for today’s readers in electronic format. $2.99, Save $1.00. The pale bodies of virgins were yet more pallid when the woman in rusty black stole away from their bed-sides. In 1934 a new type of magazine was born. Known by various names — the shudder pulps, mystery-terror magazines, horror-terror magazines — weird menace is the sub-genre term that has survived today. Dime Mystery Magazine was one of the most popular. It came from Popular Publications, whose publisher Harry Steeger was inspired by the Grand Guignol theater of Paris. This breed of pulp story survived less than ten years, but in that time, they became infamous, even to this day. 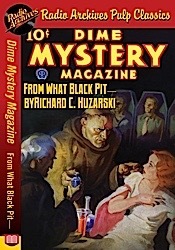 This ebook contains a classic story the pages of Dime Mystery Magazine, reissued for today’s readers in electronic format. $0.99. The possessor may kill with impunity — but at a price no man can afford to pay! In 1934 a new type of magazine was born. Known by various names — the shudder pulps, mystery-terror magazines, horror-terror magazines — weird menace is the sub-genre term that has survived today. Dime Mystery Magazine was one of the most popular. It came from Popular Publications, whose publisher Harry Steeger was inspired by the Grand Guignol theater of Paris. This breed of pulp story survived less than ten years, but in that time, they became infamous, even to this day. 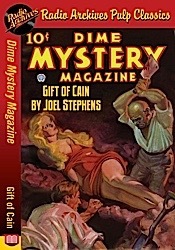 This ebook contains a classic story the pages of Dime Mystery Magazine, reissued for today’s readers in electronic format. $0.99. What fearful power was it that brought Judie Anthony's death on the eve of her wedding day? In 1934 a new type of magazine was born. Known by various names — the shudder pulps, mystery-terror magazines, horror-terror magazines — weird me most popular. It came from Popular Publications, whose publisher Harry Steeger was inspired by the Grand Guignol theater of Paris. This breed of pulp story survived less than ten years, but in that time, they became infamous, even to this day. This ebook contains a classic story from the pages of Terror Tales magazine, reissued for today’s readers in electronic format. $0.99. Nona had her own gay life to live and couldn’t spare time from her lover’s arms — to look after her wild young sister. A story of new love and ancient hatred in the grandeur of San Gabriel Canyon. One of the most popular settings for romance stories was the old west, where men were men and women were women. As many a swooning damsel could attest, "There's something about a cowboy." 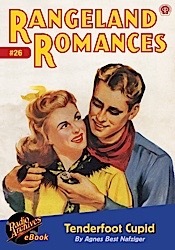 The western romance became one of the most popular types of magazines sold during the early and mid-twentieth century. $0.99. Armed with forgotten interviews, controversial essays & candid letters first not seen in generations, acclaimed pulp historian Will Murray, author of The Wild Adventures of Doc Savage, reveals the epic life & frequent deaths of the Pulp West! 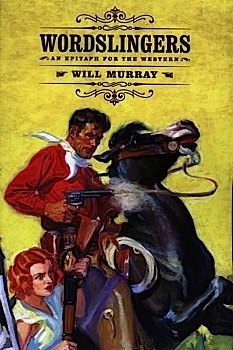 Will Murray's new book from Altus Press is not technically a history of the Western pulp magazine. Though Wordslingers contains enough info for someone to assemble a traditional history, it's much more than that. Actually, it might be a whole new breed of book. I'm not sure there's ever been anything like it before. Wordslingers captures the joy and the sadness of the 50-year saga of these history making (and history remaking) magazines. It's much more than a good read—it's an experience. Experience it yourself! The Knight of Darkness battles diabolical supervillains in classic pulp thrillers by all three "Maxwell Grants." First, the Master of Darkness confronts his greatest superfoe, Shiwan Khan,"The Golden Master," in Walter Gibson's landmark novel that inspired the blockbuster 1994 movie. Then, The Shadow battles The Light in "Death's Bright Finger," a violent thriller by Theodore Tinsley. Finally, The Shadow and his agents are faced with a "Reign of Terror" in Bruce Elliott's final (and best) pulp novel. This instant collector's item showcases the classic color pulp covers by George Rozen and Graves Gladney and the original interior illustrations by Edd Cartier and Paul Orban, with commentary by popular culture historian Will Murray. $14.95. The pulp era's greatest superhero returns in two imaginative novels by Laurence Donovan and Lester Dent writing as "Kenneth Robeson." What is the strange connection between a snowstorm in July and the death of a woman transformed into a shadow? Doc and Pat Savage journey to the Syrian Desert to unravel the strange secret of the "Murder Mirage" in the novel that inspired a 1940 Superman story! Then, a mysterious animal pelt leads Doc and his aides through a crack in the Earth to the prehistoric dangers of "The Other World." 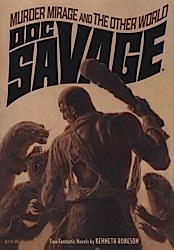 Pulp historian Will Murray provides historical commentary and a tribute to the late Doc Savage writer Philip José Farmer. This deluxe pulp reprint showcase a stunning cover painting by the legendary James Bama, the classic color covers by Walter Baumhofer and Emery Clarke and all the original interior illustrations by Paul Orban. $14.95. 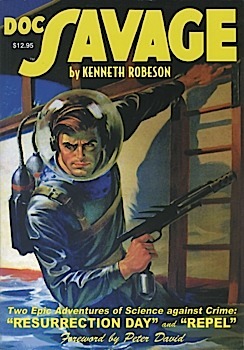 The pulps' original "Man of Steel" returns in three action-packed pulp thrillers by Paul Ernst and Emile Tepperman writing as "Kenneth Robeson." First, smuggled "Pictures of Death"are only the sinister prelude to deadly sabotage and mass destruction. Then, Justice Inc. hunts for the antidote to a deadly malady that transforms men into apelike monstrosities in "The Green Killer." Will the cure bring death to The Avenger? PLUS "Calling Justice Inc.," a bonus Avenger thriller by Spider-scribe Emile Tepperman! This classic pulp reprint showcases the classic color pulp covers by Lenosci and William Timmons, Paul Orban's interior illustrations and commentary by pulp historian Will Murray. $14.95. 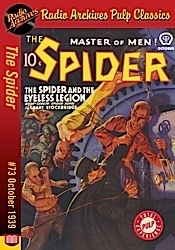 For October 1939's Spider offering, The Spider and the Eyeless Legion, Norvell W. Page narrows the focus a little bit for a creepy novel that will make you squirm while it makes you sweat. 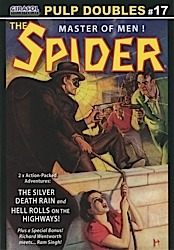 Although this one does not have as high a body count as other Spider adventures or end with a city in ruins, The Spider is faced with as dire a situation as readers will likely find in the canon and, as usual, the tale packs and emotional wallop as our hero is pushed, yet again, to the limits of his endurance and beyond. It begins with The Spider barely escaping a police drag net only to be apprehended and enslaved by a mysterious organization able to inflict blindness on their victims by means of a gas. 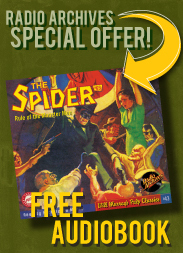 Reduced to a mere cog in the villain's nefarious machine producing bullets containing the gas for the unsuspecting police department, The Spider has to bide his time, learn all he can while he must stand by and watch his fellow New Yorkers work as slaves. That is until the love of his life, Nita van Sloan, falls into the clutches of the diabolical madman. Then The Spider explodes into action and both he and Nita wind up blind in the process! Now how can The Spider prevail against a villain whilst blind? Impossible, right? If you think so, then you don't know The Spider. And it's this struggle towards the end that sets The Eyeless Legion apart and makes it such an engaging read. Watching as The Spider, helpless with the loss of his vision and at the mercy of his captors, overcomes this seemingly insurmountable obstacle to continue his battle for justice makes for an intense read that is out of the ordinary for the genre. Along with The Spider acting as a 1930s Moses leading the enslaved in a revolt against their master who is bent on taking over the labor unions, we get to revel in the glee with which he takes the fight to the enemy needing to be everywhere at once as the pages fly by. Preventing a bank heist, warning the police commissioner that the bullets issued to the force contain the blinding gas, car chases galore, reuniting with his trusted aides Ram Singh and Jackson and the heart-rending blindness he and Nita suffer all combine to provide a well-rounded reading experience and one heck of a lot of fun. The novel's climax is an over-the-top masterpiece that is pure pulp and pure Spider. I enjoyed The Eyeless Legion with its focus turned squarely on The Spider's desperate need to protect the everyman. The action is not as grandiose as other offerings but no less intense despite that and the relationship between Wentworth and Nita alone is always worth the price of admission. I recommend it. Thank you for G-8! I'm looking forward to some exciting air combat. Thank you so much. I can’t say enough for the quality of the work you do. You are doing a stellar job and I can't wait to get the other children's Christmas sets to listen to with my son - we loved the Cinnamon Bear!! I'm on a high as we've just returned from a three week trip to the States. I am an Elvis Tribute artist and have been fund raising for St Jude Children's Hospital which was founded by OTR legend Danny Thomas. I did shows in Washington DC which was fascinating - I actually searched out the places mentioned in the WJSV broadcast day! We then drove to Memphis for further shows and managed to raise $21,500!! The 20 hour drive from Memphis back to DC was helped along by a mixture of Elvis and Radio Archives stuff so thanks again! Now we're back, I'll soon be ordering more titles from you! The quality never fails to astound me!! The 15 min episodes of Fibber & Molly, The Lost Episodes are some of the most amazing recordings ever! 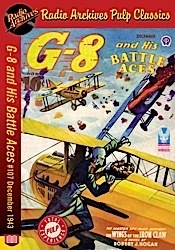 This volume contains 40 fifteen-minute episodes from 1936 and 1937, including the conclusion of The Purple Triangle (#41-53) and the beginning of The Tiger’s Claw (#54-80), for ten hours of exciting and intelligent adventure. 10 hours $29.98 Audio CDs / $14.99 Download. We have 239 radio collections and the final 12 sets are now being converted to the Digital Download format. We are very pleased to announce that 4 radio collections are available for the first time today as digital downloads.The remaining 8 sets will be released in the next month. Great shows, great sound, and great prices, too! It was CBS News commentator/curmudgeon Andy Rooney who once observed, "A lot of people think, as I do, that they appreciate Bob and Ray more than anyone else does." 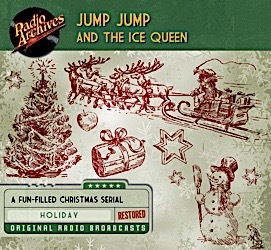 Included in that "a lot of people" are undoubtedly old-time radio fans, many of whom have delighted in the offbeat radio antics of Messrs. Elliott and Goulding for the past half-century. Both men capitalized on their uncanny ability to intuit what each other was thinking to carve a small niche in the field of entertainment, generating big laughs by gently skewering and mocking the banality and pomposity of the business in which they had devoted both their careers: radio. Boston native Robert Brackett Elliott was hired by 5000-watt radio station WHDH shortly after the start of World War II and, upon completing his stint in the service, returned to continue working the station's morning drive time slot as a disc jockey. At that same time, the station also hired Raymond Walter Goulding to do WHDH's hourly newscasts. Goulding was also a fellow New Englander, having been raised in nearby Lowell. The two men soon discovered that they enjoyed a real rapport over the airwaves and, after Goulding's newscast was over, he would often join Elliott in witty, ad-libbed skits that slowly and surely developed a devoted fan base. 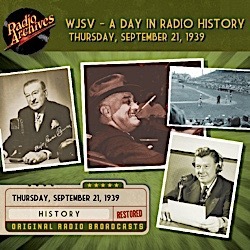 When WHDH obtained the rights to the Braves-Red Sox games, management offered the two men twenty-five minutes before the start of each game to showcase their unique buffoonery, and dubbed the proceedings with the catchy title "Matinee with Bob and Ray." 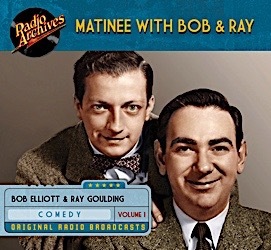 "Matinee with Bob and Ray" continued on WHDH in various formats and time slots until 1951. Thanks to the efforts of Bob and Ray fan Sheryl Smith, who helped us to gain access to the original 16" WHDH transcriptions, Radio Archives is able to present the two men at their finest, with a collection of hilarious "Matinee" shows that now sound better than ever before. 10 hours. Regular Price $29.98 - Specially priced until August 29 for $14.99 Audio CDs / $7.49 Download. For ten grim years, The Spider battled the Underworld, imprinting his scarlet seal on the bodies of the criminals he slew. No one knew his name. His face was unknown. 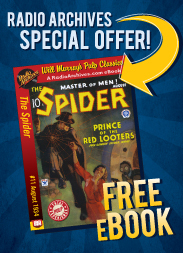 Pursued by the police, sought by the mob, The Spider crushed crime with a blazing intensity never witnessed before or since. Now he's back with a vengeance in a new series of audiobooks retelling his pulp-pounding exploits, as chronicled by Norvell W. Page, writing as Grant Stockbridge. 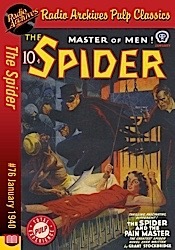 Garbed in a black silk cloak, slouch hat and wearing an assortment of masks and strange disguises to make him look as fierce as his namesake, The Spider ran roughshod over a vicious legion of thugs and hoodlums, leaving behind him a trail of cold corpses branded by his calling card, a scarlet spider burned into their foreheads. 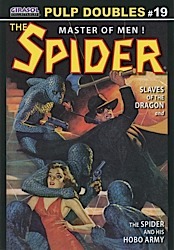 After three years of writing The Spider, Norvell Page suddenly dropped out in the Fall of 1936. No one is sure why this was, but nervous strain due to overwork, along with making unforgiving monthly deadlines, are the likeliest explanations for Page abandoning The Spider series. For several months, Emile C. Tepperman ghosted the series as Grant Stockbridge. Suddenly, Norvell Page returned. And he returned with a vengeance! 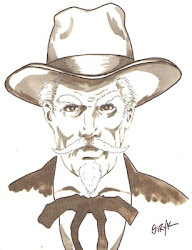 Tepperman introduced a new character to the series, Ben Lasker, but Page ruthlessly obliterated him in the beginning of his return novel, The Man Who Ruled in Hell. Not content with that, Page introduced a new alternate identity for Richard Wentworth, safecracker Blinky McQuade. The Man Who Ruled in Hell pits the Master of Men against The Red Hand, a vicious supercriminal who has audaciously unionized New York’s Underworld. But how can Richard Wentworth overcome this new threat when he himself has been cast in prison? 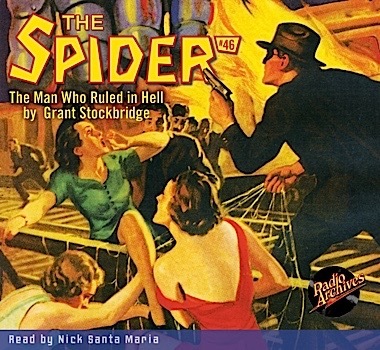 This thrilling Spider audiobook features acclaimed voice talent Nick Santa Maria, who has made The Spider his own! Also included is Arthur Leo Zagat’s “Doc Turner–-Slave Buyer,” read by Roy Worley. 6 hours $23.98 Audio CDs / $11.99 Download. Must New York bow down in abject terror before the relentless onslaughts of the IRON MAN — the super-criminal who could direct gigantic steel robots to spill the blood of hundreds at his merest whim?... Richard Wentworth said no! Yet his only weapons with which to back his heroic denial were his few loyal aides, and the garb of The Spider, Master of Men!... The greatest Spider story ever told! Total Pulp Experience. These exciting pulp adventures have been beautifully reformatted for easy reading as an eBook and features every story, every editorial, and every column of the original pulp magazine. $2.99. Out of the caverns of the lost came the deathless beast-men of Herr Goulon, Hunland’s Master-mind of Murder and to save the world he was fighting for, the Ace American Flying Spy had to undertake a solo flight beyond the grave! 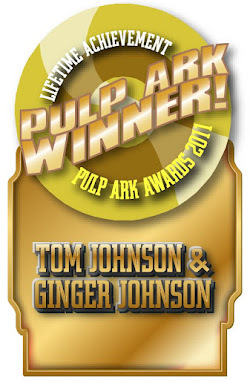 Total Pulp Experience. These exciting pulp adventures have been beautifully reformatted for easy reading as an eBook and features every story, every editorial, and every column of the original pulp magazine. $2.99. Bill Combat stands beside the dead body of his mother and swears an oath, before God and man, which her murderers shall perish by his hand! Here is an American Ace, thrown into the hell and misery of Europe’s war, offering his life, his courage, his guns and his flying skill, that dictators may vanish from a troubled world! Fly the skies of early World War II with Captain Bill Combat — the war ace who fought across Europe through the smoke of human liberties as it vanished from the earth. Fearlessly he battled the minions of the Nazi war machine. The Nazi evil had murdered his mother and uncle, and he vowed vengeance. It was a rousing call to America, which had not yet entered the war. 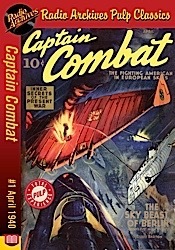 But it was a call that only lasted for three issues of Captain Combat magazine: April, June and August of 1940. Captain Combat was a symbol created by author Barry Barton to do and say the things that America couldn't officially say in those perilous times. Read along as blue skies turn red above, as green pastures become the barren homes of the dead. Today it stands as a rare glimpse of what fear fanned across America in the days when war was an ominous threat upon a bloody horizon. 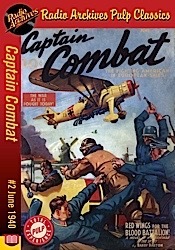 Captain Combat returns in these vintage pulp tales, reissued for today’s readers in electronic format. $2.99. In 1934 a new type of magazine was born. Known by various names — the shudder pulps, mystery-terror magazines, horror-terror magazines — weird menace is the sub-genre term that has survived today. Dime Mystery Magazine was one of the most popular. It came from Popular Publications, whose publisher Harry Steeger was inspired by the Grand Guignol theater of Paris. This breed of pulp story survived less than ten years, but in that time, they became infamous, even to this day. 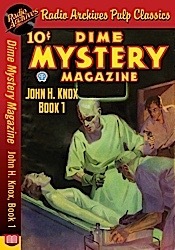 This ebook contains a collection of stories from the pages of Dime Mystery Magazine, all written by John H. Knox, reissued for today’s readers in electronic format. $2.99. I let my wife stand witness to Dr. Klitgard’s monstrous experiments with a giant ape — against my will... Good God! Could I have only known the ghastly plan went further... In 1934 a new type of magazine was born. Known by various names — the shudder pulps, mystery-terror magazines, horror-terror magazines — weird menace is the sub-genre term that has survived today. Dime Mystery Magazine was one of the most popular. It came from Popular Publications, whose publisher Harry Steeger was inspired by the Grand Guignol theater of Paris. This breed of pulp story survived less than ten years, but in that time, they became infamous, even to this day. This ebook contains a classic story the pages of Dime Mystery Magazine, reissued for today’s readers in electronic format. $0.99. Enden built his setting with the genius of the damned — and the mad gods laughed when his vengeance plan proved a deadly boomerang! In 1934 a new type of magazine was born. Known by various names — the shudder pulps, mystery-terror magazines, horror-terror magazines — weird menace is the sub-genre term that has survived today. 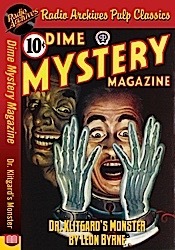 Dime Mystery Magazine was one of the most popular. It came from Popular Publications, whose publisher Harry Steeger was inspired by the Grand Guignol theater of Paris. This breed of pulp story survived less than ten years, but in that time, they became infamous, even to this day. 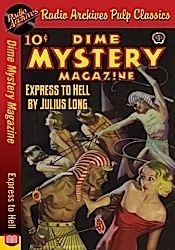 This ebook contains a classic story the pages of Dime Mystery Magazine, reissued for today’s readers in electronic format. $0.99. In the abandoned clipper's rotting hold, Bruce Cameron saw his sweetheart go mad with a strange and frightful greed! In 1934 a new type of magazine was born. Known by various names — the shudder pulps, mystery-terror magazines, horror-terror magazines — weird me most popular. It came from Popular Publications, whose publisher Harry Steeger was inspired by the Grand Guignol theater of Paris. This breed of pulp story survived less than ten years, but in that time, they became infamous, even to this day. This ebook contains a classic story from the pages of Terror Tales magazine, reissued for today’s readers in electronic format. $0.99. Sourapple Gulch was a city of dreary, unhappy women. Pert Cinnie was sure she had the right remedy to liven up the girls — even though handsome Rand thought her a frivolous brat. A story of new love and ancient hatred in the grandeur of San Gabriel Canyon. One of the most popular settings for romance stories was the old west, where men were men and women were women. As many a swooning damsel could attest, "There's something about a cowboy." 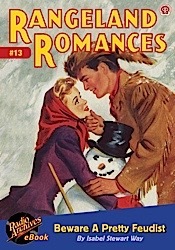 The western romance became one of the most popular types of magazines sold during the early and mid-twentieth century. $0.99. The Knight of Darkness battles diabolical supervillains in classic pulp thrillers by all three "Maxwell Grants." First, the Master of Darkness confronts his greatest superfoe, Shiwan Khan, "The Golden Master," in Walter Gibson's landmark novel that inspired the blockbuster 1994 movie. Then, The Shadow battles The Light in "Death's Bright Finger," a violent thriller by Theodore Tinsley. Finally, The Shadow and his agents are faced with a "Reign of Terror" in Bruce Elliott's final (and best) pulp novel. This instant collector's item showcases the classic color pulp covers by George Rozen and Graves Gladney and the original interior illustrations by Edd Cartier and Paul Orban, with commentary by popular culture historian Will Murray. $14.95. The pulp era's greatest superhero returns in two imaginative novels by Laurence Donovan and Lester Dent writing as "Kenneth Robeson." What is the strange connection between a snowstorm in July and the death of a woman transformed into a shadow? Doc and Pat Savage journey to the Syrian Desert to unravel the strange secret of the"Murder Mirage" in the novel that inspired a 1940 Superman story! Then, a mysterious animal pelt leads Doc and his aides through a crack in the Earth to the prehistoric dangers of "The Other World." 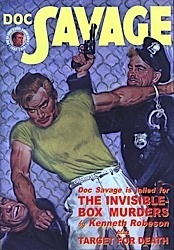 Pulp historian Will Murray provides historical commentary and a tribute to the late Doc Savage writer Philip José Farmer. This deluxe pulp reprint showcase a stunning cover painting by the legendary James Bama, the classic color covers by Walter Baumhofer and Emery Clarke and all the original interior illustrations by Paul Orban. $14.95. 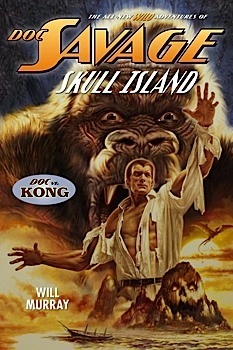 Doc Savage announces to the world that he has succeeded in a quest that has eluded man for thousands of years. He has discovered a way to resurrect the dead! Doc asks the general public whom they think he should resurrect. The consensus is that he should revive the man reputed to have been the wisest man to ever live, King Solomon. But nefarious forces are at work. They substitute the mummy of the evil Egyptian Pharaoh Pey-deh-eh-ghan for King Solomon. This Pharaoh was reputed to have hidden a secret treasure which was never found. Doc does not discover the substitution and the Pharaoh is resurrected. The villains who made the switch come to claim their prize but they soon discover that Pey-deh-eh-ghan is more crafty and nefarious than they thought. He adapts well to the 20th Century and lights out on his own to recover his treasure wreaking havoc and destruction at every turn. Meanwhile, Doc Savage and his Iron Crew continue in pursuit hoping to stop the mad Pharaoh and the criminals who have unleashed him on mankind. Can Doc stop this reign of terror? Will he be able to bring Pey-deh-eh-ghan to justice? Does the fabled lost treasure even exist after thousands of years? Thanks for all your work! The Secret 6 is another great audiobook my husband will love. I received my books and they are perfect. The packaging was excellent, as well. Thank you for always giving my books special attention. Be back soon! 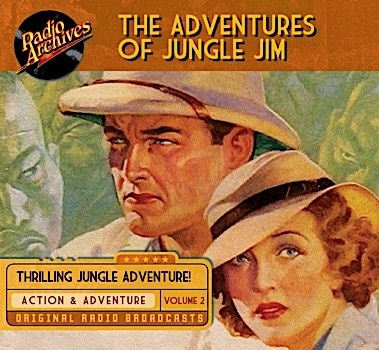 I loved the audio clip of Jungle Jim that was in a recent newsletter. I absolutely love your audio books and can see why they are your most popular products. I'm so enjoying Joey d'Auria performing the Doctor Death audio book. 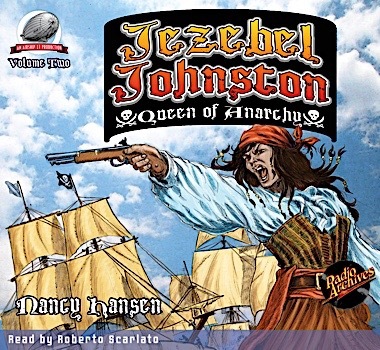 I've never heard audio books this well done before.